SH wave NDT uses some specialised hardware. PPM EMATs are an effective way of emitting and receiving SH waves. SH waves will be generated using Electro-Magnetic Acoustic Transducers (EMATs); advantages include avoiding the use of couplant, and the ability to operate on curved surfaces without needing to profile match. 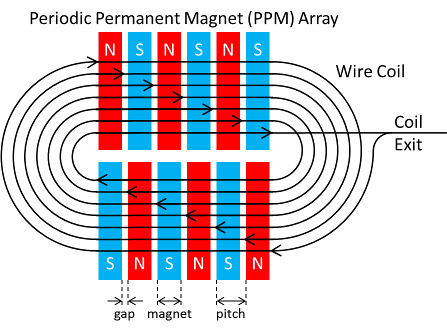 A periodic-permanent-magnet (PPM) EMAT generates and receives SH guided waves, and has magnets arranged such that the North and South poles alternate periodically. Due to the closely spaced elements of the magnet array used in the construction of these EMATs, the EMATs need to be close to the surface of the sample, to ensure that the forces generated in the sample surface have a strong, periodic variation, which mirrors the periodic variation of the transducer array. An SH wave is transmitted in the direction of the periodic variation. This figure depicts a PPM EMAT, with the alternating magnets and the overlaid "racetrack" coil shown. The magnetic field switches direction periodically. For this project, the EMATs are given current pulses consisting of a user definable number of single frequency cycles. "ePortfolio - Phil Petcher" by Phillip A. Petcher is licensed under a Creative Commons Attribution 3.0 Unported License.